Poulet roti a l’ail’, Chicken with 40 cloves of garlic. A Meal With Friends. Sorry, only one photo. We lived in France for many years and made a number of close friends, several of whom keep in touch. Joel and Marie, for instance. We were in the area, so Marigold rang and asked if they would like to meet up for a meal. Yes, they would love to see us, no they would not wish to go for a meal, of course we must come to them, that was the gist of the call with Marigold, a rarity this, unable to contribute one word in ten. We arrived on foot at their small farm in the hills, hugs, kisses and gifts were changed and, finally, we took our seats. Joel poured a glass of Kir for each person; white wine mixed with a small quantity of crème de cassis. He told me, as he always does, that the name originated with a hero of the French Resistance and former mayor of Dijon, Canon Kir. This is a traditional opener to a meal with friends. ‘Santé’, Marie said in her soft voice and we toasted each other’s continued good health. Marie appeared with a steaming bowl containing a delicious leek, potato and spinach soup. Wine is never served with a soup course, except at the very end, when we were offered half a glass to add to the last few drops of soup remaining in our bowl. This old custom, known as Faire le Chabrout, involves raising the bowl to the lips and drinking the wine-laden dregs. Joel assured us that it was also customary to wipe one’s mouth with the back of a hand. Next was a mini-course; radishes served with sea-salt and creamy yellow butter. Picked fresh from the garden, washed, and served with the green fronds still attached. The radish is picked up by the fronds, then dipped in turn into butter and salt before eating. Like all vegetables, best when served absolutely fresh, these radishes were still in the ground ten minutes ago, Marie having slipped outside to pick them, and given them a quick wash, while we were finishing the last of the soup. I already had a broad hint of what to expect as the aroma seeping through from the kitchen was unmistakable. ‘Poulet roti a l’ail’, Marigold whispered and so it was. 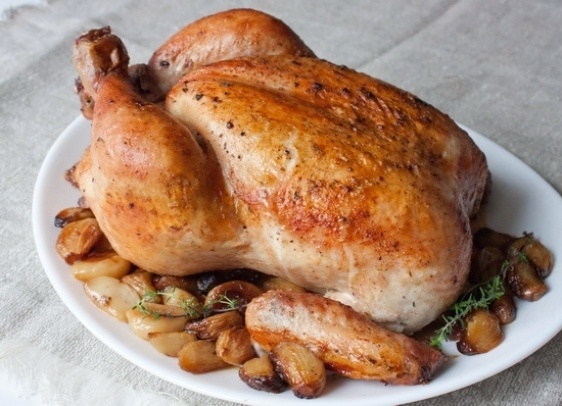 Chicken, cooked with 40 cloves of garlic. 40 cloves seem to be the magic number for this dish, although I am told that the actual number of cloves does not have to be that specific. This is Marie’s specialité, and was greeted with acclamation as our taste buds switched into over-drive. The rich blend of tender chicken, garlic, olive oil and white wine, was a magnificent feast. Joel wiped the last morsel from his plate, and, pushing his chair slightly away from the table, stretched out his legs with a great sigh of satisfaction. ‘Magnifique’, he said, quite simply and with the utmost sincerity. Marie blushed with pleasure as we raised our voices in a chorus of approval. ‘It’s nothing’, she said shyly, modest as always. Dishes of vegetables followed, each with a generous knob of butter, and served separately from the meat in order to savour each dish to the full. Young, tender green beans, baby shallots, white waxy potatoes and a vegetable described as cardons, looking rather like turbo-charged celery served with a crème fraiche sauce, and completely unfamiliar to me, but grown by Marie in her kitchen garden. Almost everything we ate or drank during the evening had been produced on the farm. Although our hosts are very far from wealthy, their diet of meat, fresh vegetables, fruit, herbs and dairy produce is second to none. Fresh food is the norm, with almost no tinned or ‘convenience food’ in evidence. The farm supports a wide range of animals, cows, sheep, goats, ducks, geese, chickens, pintades or guinea fowl wonderful at killing snakes and better than a dozen burglar-alarms, turkeys, rabbits, and two pigs. Joel has enough vines to make wine for his own use throughout the year, and half a dozen beehives. He was absolutely right. The cheese was superb and wonderfully complemented by the wine. Cheese has a high prominence in the order of a French meal. Rather than tagged on at the end of a meal, almost as an after-thought, as is the usual case in England, it is always offered as part of the meal, forming a natural bridge between the main course and the following dessert. A knife and fork are all that is provided as accompaniment, together with red wine. Bread may occasionally be provided, but never with butter, and crackers are virtually unknown. The cheese was simply superb. Two different cheeses, both made on the farm, were offered, but served in such a way as to provide an incredible range of tastes and flavours. First, goats’ cheese made in the traditional shape reminiscent of Crottins de Chavignol. The shape can be imagined from a translation of Crottins, the most polite version being ‘horse droppings’. Then, a cheese apparently unique to the farm as I have never seen any like it elsewhere made from either cow or goat’s milk, or a combination of both. We had the combination, shaped like a fat cigar covered with a dusky rind. Using these two different cheeses, a selection of each was offered at different stages of its life, ranging from fresh creamy young cheese to a hard strong variety, matured for a considerable period of time. My plate contained six slices of each cheese. Each slice was taken from a cheese at a different stage of maturity. Joel told me to eat the slices in a particular order, working clockwise around the plate, starting with slices of fresh cheese, very smooth and creamy and progressing to the most mature. By the end I was enjoying cheese at its most magnificent, firm, strong and wonderfully pungent. Only two varieties, but a dozen different tastes and textures, accompanied by strong red wine and a stiff jelly of apple and some other ingredient which baffled me completely. ‘What is this, apple and something?’ I asked. ‘Cotignac’, replied Marie which was no help at all as the word was unfamiliar. She repeated it several times, but still I did not understand. Joel excused himself, returning shortly with an example of the fruit, picked fresh from the tree. Its velvety texture was un-mistakable. ‘Oh, of course’, I said, ‘Quince’. ‘Coing’, Joel corrected firmly, and another useful word was added to my vocabulary. Joel enjoyed his wine to such an extent that he decided it was time for a song. He entertained us with a song which involved his little finger protruding from the fly buttons of his trousers, while dancing around the room. Bizarre, but unforgettable. Dessert was served, together with chilled bottles of Coteaux du Layon, a wine from the Loire Valley of a type which translates as ‘luscious’ - strawberries served with crème fraiche. The rest of the evening passed in a blur of sensations. More singing, telling of stories, and good companionship, the ideal meal with friends. Strong dark coffee was served, after which Joel and I cleared away the dishes and washed up. It was clearly an unfamiliar task on his part, as he had not the faintest idea where any of the items was to be stored. After washing and drying, and reluctant to disturb Marie’s kitchen routine, we left everything stacked in neat piles, ready to be put away. A second cup of coffee prompted the offer of a digestif. My newfound word ready on my tongue I chose a quince liqueur, wonderfully smooth and quite delicious. Marigold, adventurous as ever, requested Baie du Houx, a liqueur made from holly berries, very strong and of quite a unique flavour. I know this because I was obliged to finish most of it! Joel poured himself a small glass of neat Eau de Vie which he drank in a single motion, throwing back his head and laughing as tears sprung to his eyes. Eau de Vie, literally water of life, is distilled from fruits of various types. As a pure spirit, it is colourless and retains the scent of the fruit from which it was distilled. Incredibly strong, it is widely praised as a digestif, and I can certainly vouch that it ‘hits the spot’. We took our leave some seven hours after arrival. A fine night for a walk, warm and pleasant with stars filling the sky, and we spent the entire journey reminding ourselves of the pleasures we had experienced. The wonderful food, the superb wine, and, most of all the delightful company of our hosts. A night we will never forget.